It didn’t come as a surprise to me that the once golden Nokia would adopt the still fledgling Windows Phone 7. My prediction is an eventual takeover Trojan horse style. 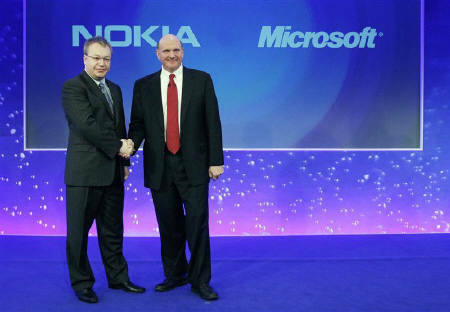 If Stephen Elop had really wanted Nokia to make a surge at the races, he could’ve gone with Android. Instead, he chose Limpbiscuit, a platform that so far hasn’t had much success. Meanwhile, every day adds a new drama to this wrong-wrong alliance. I’m not really keeping up with the developments but TH’s loving the drama as he has worked in both companies in his previous life. The latest, I’m told, will be an intervention to oust Elop. I just want to be right. Yesterday was TF’s big birthday. He didn’t want to make a fuss of it but agreed in the end to dinner at a venue of his choosing (Lotus Vegetarian Restaurant at Quality Inn Hotel) and invitation for a few friends (five so that we’d fit nicely on one table). Lotus Vegetarian isn’t new to us. We’ve been there several times and always enjoyed the buffet. The spread was wide, the food: good, the price: reasonable. When I called to make a reservation, they told me the buffet wouldn’t be available; we’d have to order from the menu. Never done that before but what’s the big deal? So there we were trying to figure out what to order. If you’ve never been to a Chinese vegetarian restaurant, ordering from a menu can be interestingly confounding, mainly because the dishes sound different, but sometimes, it’s all the same food. TB and I settled on the set menu eventually ‘cos it just made things easier. We also added a small plate of noodles for birthday symbolism. Needless to say, there was an obscene amount of food. We couldn’t finish every single dish despite there being 11 of us feeding on a menu for ten. The dishes were pretty good although at some point, the sauces were similar. TF likes to eat gravy dishes with mustard ‘cos he finds it adds a good punch. I added it just to make it taste different. At the end of the meal, everyone was well and truly fed groaning about the amount of food consumed, and we left the restaurant carrying four doggie bags. While driving home, the Godmother (TGm) asked how much the dinner was. When TH mentioned it was about $500+, TGm was shocked. I hadn’t thought about it till then, actually. I received the bill, checked the items and TH signed for it. Didn’t give it a second thought. But TGm’s reaction caused us to mull it over and the more we talked about it, the more outrageous it seemed. After all, we really only ate vegetables. TGm then related her lunch experience at Thai Express, which was equally outrageous – $14 for a plate of extremely oily glass noodles with a teeny, tiny piece of crayfish. I’ve had that before – it’s a miserable, miserable dish. The truth about dining in Singapore, the land of great food, is that numerous restaurants in the casual to mid-tier dining category are abysmal. They tend to be over priced, serving sub standard food. Yet, there’s a proliferation of them and some even do well. I don’t understand why. Then there are those like Lotus Vegetarian that may be taking advantage of the festive season to raise prices beyond what is acceptable. OK, we did accept the price but is it really acceptable? I suppose as long as there are fools like us, these places will survive. What really capped the night was TH muttering at midnight that he was hungry. Time for a dining pledge in our household.